Large-scale structure (LSS) in cosmology refers to the distribution of visible matter, dark matter, galaxies, galaxy clusters, basically everything with mass, on scales far larger than the size of any one galaxy. Over time, gravity tends to draw things together and more coherent structures (clusters or filaments of galaxies) emerge. On the other hand, the effects of dark energy accelerating the expansion of the Universe slows down the development of these structures. Studying large-scale structure over the history of the Universe is thus an important way of studying the properties of dark energy, dark matter and gravity, and their macroscopic effects on the Universe. Ross works on various projects measuring the growth of large-scale structure over time. Within the Dark Energy Survey, he has been part of teams studying LSS using galaxies and gravitational lensing (including lensing of the Cosmic Microwave Background). 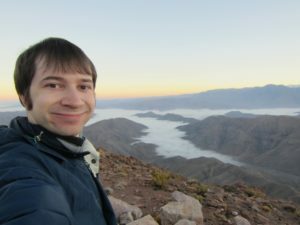 Most recently, he is part of a team trying to use information in the structure to improve measurements of the redshifts of galaxies, which correlates to their distance from us. Ross is also a frequent editor of the Darchives. In high school I took an astronomy class and by the end of the first day I wanted to be an astronomer. That hasn’t changed since. I was always a fan of science fiction, but until hearing a bit about astronomy, I hadn’t realized how much real, amazing stuff we know about the Universe and how much more is potentially within our grasp to learn, even if we’re many years away from becoming a real space-faring society. Growing up, two of my favorites were Star Trek (TNG, Voyager, DS9) and the X-Files. Both of which certainly contributed to my interests in space and science. I’ve been catching up a bit on those series in the past few years. Talk to people one or two ‘steps’ above you and ask them for advice. If you’re in grade school or college, ask an older science student what books or classes they’ve found useful. If you’re looking to major in a science or go to graduate school, reach out to someone who has done that and ask for advice and insight into what that’s like. Don’t be afraid to talk to people. Same for when you do get stuck on a specific science problem, sometimes just talking to someone gives you the new perspective you need.